326 pages | 103 B/W Illus. Potential applications of nanotechnology in food industry include: encapsulation and delivery of substances in targeted sites, increasing flavor, introducing antibacterial nanoparticles into food, enhancing shelf life, sensing contamination, improved food storage, tracking, tracing, and brand protection. 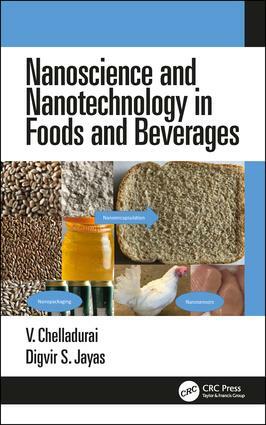 This book provides a basic understanding of the nanoscience and nanotechnology and their applications to different food industry sectors, covering both benefits and drawbacks using nanotechnology in food processing and discussing the development of an international regulatory framework. Dr. V. Chelladurai was educated at the Tamil Nadu Agricultural University; and the University of Manitoba, and is currently working as an Associate Professor, Agricultural and Food Processing Engineering in the Department of Agriculture Engineering, Bannari Amman Institute of Technology, Sathyamangalam, Tamil Nadu, India. Before joining the Bannari Amman Institute of Technology, Dr. Chelladurai worked as a Post-Doctoral Fellow, and Research Engineer in the Department of Biosystems Engineering, University of Manitoba for six years. He conducted research on applications of imaging and spectroscopy for agricultural and food products, hermetic storage of cereal grains and oilseeds, drying and non-chemical methods for stored grain management. He authored or co-authored 21 technical articles in peer-reviewed journals, 11 technical articles in conferences and 1 book chapter. He also served as a technical expert in Canadian International Grain Institute’s training programmes for various stakeholders of Agri-Food industry. He is recipient of "2016 Superior Paper Award" from American Association of Agricultural and Biological Engineers (ASABE), and also recipient of University of Manitoba Graduate Fellowship, W.E. Muir Fellowship, Edward R. Toporeck Graduate Fellowship, and Gordon P. Osler Graduate Scholarship for his academic and research excellence during his time at the University of Manitoba. Dr. Chelladurai served as Vice-President (Regional), and Manitoba Regional Director for the Canadian Society of BioEngineering (CSBE) from 2010-2016. Distinguished Professor Dr. Digvir S. Jayas was educated at the G.B. Pant University of Agriculture and Technology in Pantnagar, India; the University of Manitoba, and the University of Saskatchewan. Before assuming the position of Vice-President (Research and International), he held the position of Vice-President (Research) for two years and Associate Vice-President (Research) for eight years. Prior to his appointment as Associate Vice-President (Research), he was Associate Dean (Research) in the Faculty of Agricultural and Food Sciences, Department Head of Biosystems Engineering, and Interim Director of the Richardson Centre for Functional Foods and Nutraceuticals. He is a Registered Professional Engineer and a Registered Professional Agrologist. Dr. Jayas is a former Tier I (Senior) Canada Research Chair in Stored-Grain Ecosystems. He conducts research related to drying, handling and storing grains and oilseeds and digital image processing for grading and processing operations in the Agri-Food industry. He has authored or co-authored over 900 technical articles in scientific journals, conference proceedings and books dealing with issues of storing, drying, handling and quality monitoring of grains and processed foods. Dr. Jayas has received awards from several organizations in recognition of his research and professional contributions. He is the recipient of the 2017 Sukup Global Food Security Award from the American Society of Agricultural and Biological Engineers (ASABE) and the 2008 Natural Sciences and Engineering Research Council (NSERC) Brockhouse Canada Prize. In 2009, he was inducted as a Fellow of the Royal Society of Canada. He has received professional awards from the Agriculture Institute of Canada, Applied Zoologists Research Association (India), American Society of Agricultural and Biological Engineers, Association of Professional Engineers and Geoscientists of Manitoba, Canadian Institute of Food Science and Technology, Canadian Academy of Engineering, Canadian Society for Bioengineering, Engineers Canada, Engineering Institute of Canada, Indian Society of Agricultural Engineers, Manitoba Institute of Agrologists, National Academy of Agricultural Sciences (India), National Academy of Sciences (India) and Sigma Xi. Dr. Jayas serves on the boards or committees of many organizations including: ArcticNet, Cancer Care Manitoba Projects Grants and Awards Committee, Churchill Marine Observatory (CMO), Composite Innovation Centre, Engineers Canada, Centre for Innovative Sensing of Structures (SIMTReC), Genome Prairie, GlycoNet, Manitoba Centre for Health Policy, National Coordinating Centre for Infectious Diseases (NCCID), North Forge Technology Exchange, NSERC Council, Oceans Research in Canada Alliance Council, Research Manitoba, Research Institute of Oncology and Hematology, and TRIUMF. He has served as the President of Agriculture Institute of Canada, Association of Professional Engineers and Geoscientists of Manitoba (Engineers and Geoscientists Manitoba), Canadian Institute of Food Science and Technology, Canadian Society for Bioengineering, Engineers Canada, and Manitoba Institute of Agrologists. He currently chairs the board of directors of RESOLVE, a prairie research network on family violence; TRIUMF, Smartpark Advisory Committee, and NSERC Council.